Vegan Queso - made in only five minutes with 7 ingredients! Make this incredible vegan queso in 5 minutes flat, no cashew-soaking or even a stove top required! It’s creamy and flavorful and just begging to be poured (slow-mo-style) over all your nachos, tacos, and basically your entire life. When it comes to dipping, are you a salsa or a queso? In my experience, people are either one or the other. And while my dear T is most definitely the former, I have always been a queso kinda girl! Queso was basically a food group for me when I was a teenager. Loved. the. stuff. That’s why, when I went vegan (almost FIVE years ago now; wow time flies! ), I knew I had to find a vegan queso recipe I would enjoy every bit as much. Now, this was back at the beginning of my cooking journey – waaaay before we had two fancy schmancy Vitamixes gracing our kitchen counter. No, I was working with a super old, super slow blender at the time that would start smoking whenever I tried to make anything cashew-based. And unfortunately, the only vegan queso recipes I was finding involved some type of nut cream base. These were dark queso-less times in our home, friends. But then, I discovered a simpler option that would provide the creamy canvas upon which I would build my queso masterpiece: silken tofu. Immediately, I got to work. The minute I tasted the first batch, I legit lept for joy. The spicy cheesy flavor POW, the creamy luscious texture, it was all there. It was easily one of the best moments of my vegan life. Do you think my feelings for vegan queso are a little much? Perhaps. 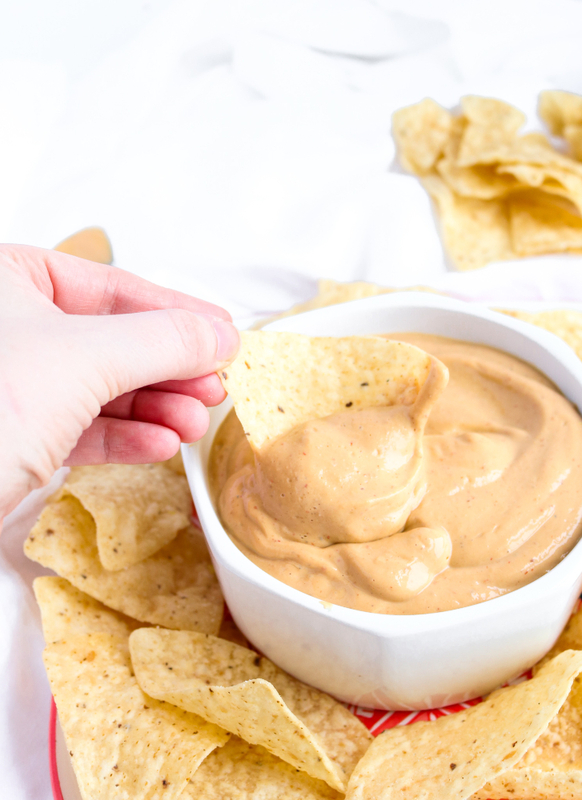 But either way, I think you’re gonna LOVE this vegan queso recipe. When I say you can make this vegan queso in under five minutes, I’m not being hyperbolic. Literally from start to finish, this vegan queso comes together like a dream. You’ll throw all your ingredients in a food processor or blender (remember, you don’t need a fancy high-powered blender for this!) and blend until smooth and creamy-dreamy. That’s IT! From there, you can heat it a bit on the stove if that’s your thing, but I’ve always been a straight-outta-the-jar kinda queso eater which is the way I love to serve this stuff. Get in there with your chips and DIP, sister! 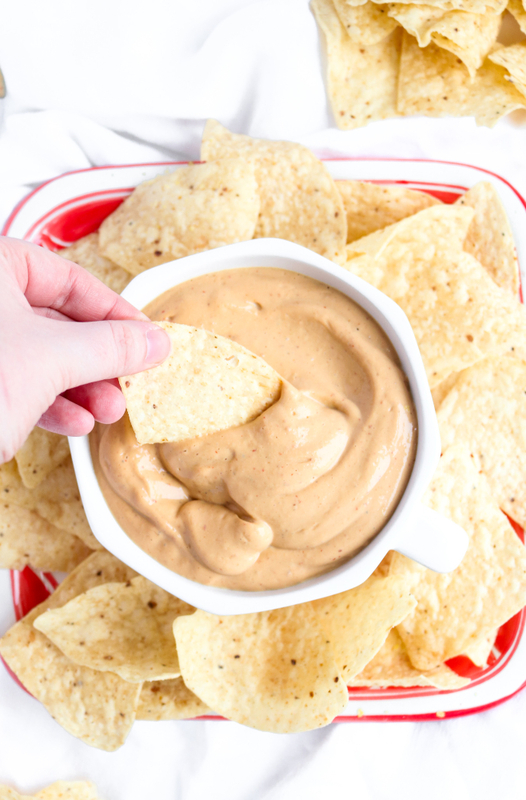 If you’re a queso-fiend like me, you have GOT to make this vegan queso for your next party or boring Saturday afternoon when you’re hankerin’ for a snack. It would be perfect for your upcoming Super Bowl parties and is a downright lovely addition to your weekly Taco Tuesday festivities (especially when served with our spicy walnut beef). 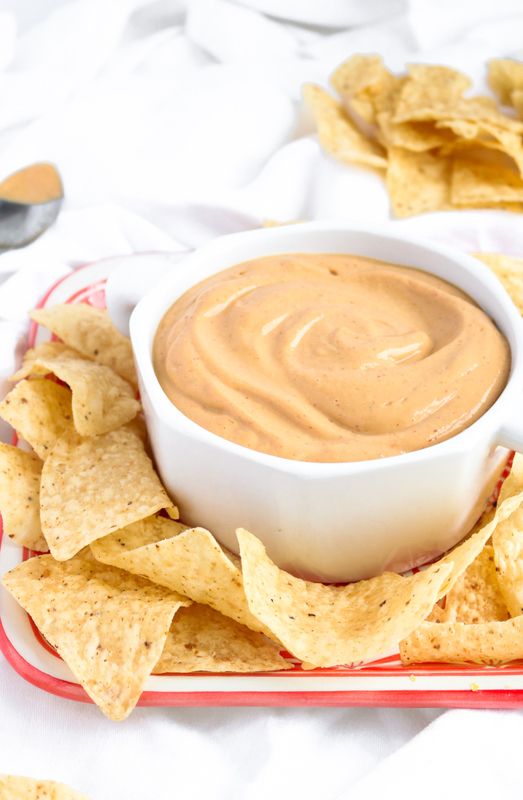 When you do try this vegan queso recipe, we’d love to hear how it went and do a little dance around the kitchen to help you celebrate! You can rate the recipe and leave a comment below or snap a photo (you know, before you inhale the whole thing) and tag us on Instagram! 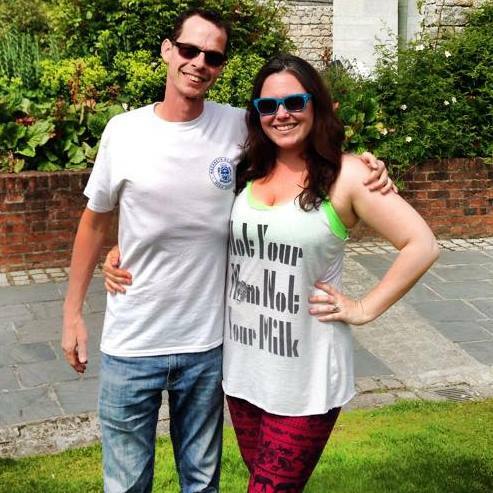 If you’re not already following along there, we’re @theplantpowercouple with the “the”. We hope this kickass vegan queso makes alllll your queso dreams come true. Happy cooking! Make this incredible vegan queso in 5 minutes flat, no cashew-soaking or even a stove top required! It's creamy and flavorful and just begging to be poured (slow-mo-style) over all your nachos, tacos, and basically your entire life.? Add all ingredients to a blender or food processor and blend until smooth and creamy. If you're looking for a thinner queso texture, feel free to add some veg broth until it reaches your desired texture. For full flavor yumminess, make the broth with our veggie bouillon powder . We like to serve this cold, but if you like your queso warmed, you can do so on the stove. If you're warming it, I definitely suggest adding a little of the aforementioned broth first. Serve with chips as a dip or poured over tacos. Enjoy! *You can find canned chipotle peppers with the other Goya products at your grocery store. We also find them at Target with the rest of the canned goods.